At the end of last year, I was fortunate to be invited to the National Institute of Fitness and Sport in Kanoya, Japan by Associate Professor Tomohito Wada, for a month-long research placement. This trip was to be my first visit to Japan, a very significant place for my area of expertise (Sports Engineering) as the research field started here in the 1980’s. I met Wada sensei when he came to do a year-long sabbatical at Griffith University, Brisbane, Australia in our sports engineering faculty. I was delighted to accept his invitation of visiting Kanoya to further our research collaboration at the brilliant Sports Performance (SP) lab. My trip started with a small delay, with my flight from Tokyo to Kagoshima having to return to Tokyo as a typhoon had emerged which caused some large turbulences when our plane tried to land in Kagoshima, forcing the return to Tokyo. One day behind schedule I landed in Kagoshima. I was very impressed with the landscape and natural beauty in this area and you must be all very proud of where you live. 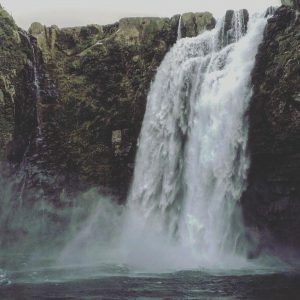 During my visit I had the opportunity to explore the mountains, go to the thermal springs in Ibusuki, see active volcanos, visit some spectacular waterfalls, and was treated to many stunning views to Kinko Bay. I also loved the culture of the Kagoshima prefecture too, there was so much beautiful food, and I was warmly greeted by friendly locals. NIFS itself is a remarkable university precinct. I believe that it is a world leader in terms of the sporting infrastructure that both students and staff have access to. Furthermore, it was great to see that these facilities are serviced by an array of impressive measurement technologies as well as passionate and knowledgeable staff. In the SP lab, I was impressed to see the very long instrumented force plate running track, the custom build indoor baseball mound, the impressive range of high speed and motion cameras, and player tracking technology that was available. Further surprising to me, was that the vast number of high level coaches who are academics at the university. This epitomises the notion of translating research to practice. NIFS was truly a terrific environment to be in, and I commend the vision of the University for creating an environment where athletes and research can be done in harmony. 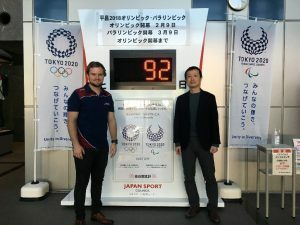 I was also excited to see many top Japanese athletes training in the university facilities and being serviced by the academics, this is something that does not happen in many parts of the world. 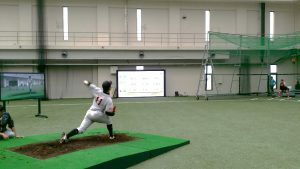 The research that I conducted in collaboration with the team from the Sports Performance Lab was monitoring baseball pitching kinematics. This study involved a cross validation of my inertial sensor data (which we designed at Griffith University) with motion capture, force plates, and Trackman Doppler radar data. The aim is to eventually create a wearable that could reduce injury caused by baseball pitching and increase pitching accuracy. The initial results look really promising, and I am aiming to publish this study later on in the year. Baseball research underway in the SP Lab. Since I have been back in Australia I have told many other researchers about my visit to Kanoya, many of whom are very jealous and are trying to plan their own trip to Kanoya. I have even appeared on national Australian television news appearing in my Kanoya shirt talking about sports engineering innovations ahead of the Commonwealth Games! 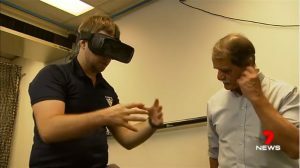 A recent appearance on Australian national television from inside my lab featuring myself on the left and Professor David Thiel on the right. Of course, very exciting times lie ahead for Japan in the world of sport. Firstly, with the Rugby world cup next year and then of course the Tokyo 2020 Olympics. I have no doubt will be the best sporting celebration the world has ever seen and I am hoping to attend both events. My deepest thank you goes to Wada sensei and his family for making me feel so welcome in Japan. Thank you to all the staff and researchers from the SP Lab and from NIFS more broadly for being so hospitable and sharing your culture with me. It was a terrific experience and I look forward to returning to Kanoya soon. Wada Sensei and myself at JISS in Tokyo.